The Jasper County Commissioners met on Monday with a short agenda and a huge audience. The meeting could not be moved to a court room because the courts were in session. First on the agenda was a brief report from Stephen Eastridge, Director of the Jasper County Economic Development Organization (JCEDO). He announced that there would be a series of meetings of the task force to prepare the County for the 2023 closing of the Schahfer Plant. The first will be on Jan 23 at 7:00 pm at the Fase Center east of DeMotte. The speaker will be a representative of NIPSCO who will explain what and why the company is doing what it is doing. Meetings on Feb 25 and March 18 will follow. They are open to the public and I suspect the reason that the first and probably the others will be at the Fase Center is that the northern part of the County will bear the brunt of the impact of closing. He also announced that the president of the Tourism Board had resigned from the Board and the Commissioners approved a replacement for her. They approved Rensselaer, Remington, and DeMotte newspapers for legal announcements and signed off on a request from Wheatfield Township for an extension on its fire station bond from OCRA. Sheriff Williamson’s request to fill a vacancy in the jail caused by a resignation was approved. The Commissioners also approved the transfer of a truck from the Sheriff to the Surveyor’s Department. Mr Culp began by saying that the Plan Commission had said in their first December meeting that they wanted to allow wind turbines in the County but the setbacks in their draft would make them impossible. He then went through the changes that they had made. They set a height limit, which was 575 feet. The setback to any non-participating residence was a third of a mile, but that could be waived by the homeowner. They expanded the no-turbine zone around the Jasper-Pulaski Reserve and because of the dense housing in the northern part of the County, they drew a line at Division Road and made the northern half of the County a no-turbine zone. (30% of the County’s population is in Keener Township.) 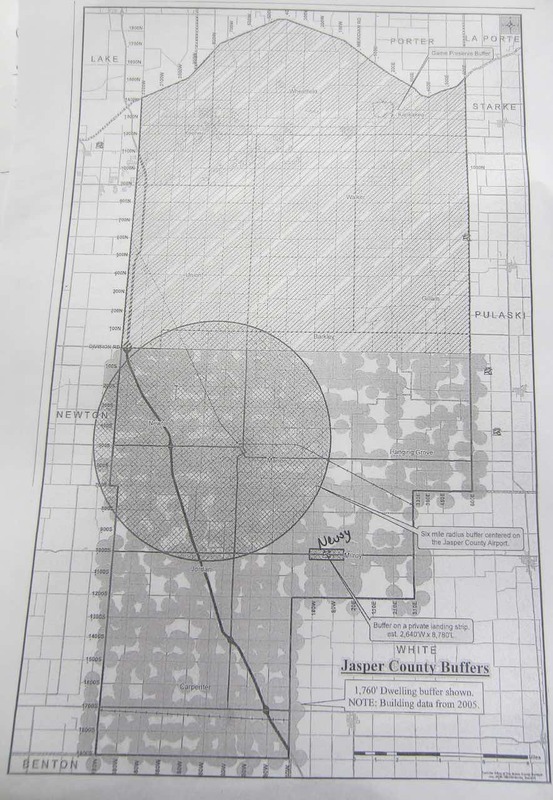 They also drew a circle with a six mile radius around the Jasper County Airport and declared that area off-limits to turbines. As a result, the proposed ordinance bans turbines in Keener, Wheatfield, Kankakee, Walker, Union, Newton Townships as well as most of Marion, Barkley and Gillam Townships and a little of Jordan Township. They are allowed in the southern parts of Barkley and Gillam Townships as well as in Milroy, most of Jordan, and Carpenter Townships. The Rensselaer City Council had passed an ordinance banning them in the two mile exclusion zone around Rensselaer but that whole ares is within the six-mile circle around the airport. The map below shows the results. On the map the smaller circles are 1/3 mile circles around buildings based on data from 2005. The turbine owner must maintain all drains and tiles within 1.5 times the tip height of the turbine for the life of the project. At this point the discussion was stopped because the agenda said it was time to open bids for a variety of things. Bids were received for tires, crushed stone, sand, trucking, and machine rental. All bids were accepted. The meeting then took a ten minute break before more bids were opened, these for road surfacing materials. Again, all bids were accepted. The floor was then open for public comments and there were many. There were questions about safety and safety zones, arguments that small landowners should be compensated for tolerating nearby towers and that larger setbacks would accomplish this, worries about fire that would spread to fields ready for harvest. Someone representing Everglades of the North said that the County should embrace wind energy because it was cleaner energy than coal, with a later speaker arguing that the carbon footprint of the turbines was huge. Another speaker worried about the possibilities of ground water contamination if the developer needed to drive piles due to soft soil. A citizen asked if the Commissioners were getting kickbacks from the wind farm developers. A speaker said that the cranes were spreading southward and now were often in fields south of Division Road. Someone said that we should consider pipelines and transmission lines in siting towers. Several people argued that because most people were against turbines, they should simply be banned, a statement that was finally contested near the end of the meeting, when the Commissioners said that those in attendance were not representative of the entire County and that there will be a lot more angry people if they do nothing and taxes rise as a result. There were more concerns about safety and how the manuals for the turbines defined the safety zone. A prominent farmer from southern Jasper County said that he represented owners of 15,000 acres who wanted wind turbines if EDP was the developer. He said that they did not want their property rights taken away by the ordinance. Later in the meeting Commissioner Maxwell said that the current interest of a developer was in the south east part of the County, south of 1200S and west of I-65. If a wind farm is built in Jasper County in the next few years, it will be here. The acreage has not yet been signed up and Remington can restrict part of that area by regulating its two-mile exclusion zone. The representative from EDP was asked about possible development and said that the earliest possible start date would be 2021. Someone asked why the Commissioners did not just accept the draft that the Plan Commission had passed unanimously. The response was that the Plan Commission was advisory and that the setbacks in the draft, if applied to the recent project in Benton County, would have eliminated 60 of the 61 towers. Someone asked about the RES meteorological tower that was supposed to be removed by the first of the year. Mary Scheurich said that in a phone call last week someone from RES said that the tower would be removed this week. Mr Culp said that landowners have more control over the wind farms than they realize. At present RES has not signed up enough land for their proposed project. I have heard that Pulaski County banned turbines, in which case their plans for Jasper County may not be viable. There was no one from RES at the meeting and their efforts in the County seem to have stopped. There were two representatives from wind farm developers in the audience and they were asked to respond to some of the questions and concerns. The depth of the pad is ten feet. If there is soft soil, piles or piers may go below that, but this is an extra expense so the developers try to site where only the ten-foot-deep pad is needed. The safety manuals are proprietary but do not have specific safety setbacks. The other representative later said that he could probably get a manual for the Commissioners. Pipelines have their own easements and the pipeline companies defend them. A wind turbine developer needs to negotiate with the pipeline company if they are in the area of the wind farm. Typically the wind farm developer has at least four agreements with a County: an economic development agreement, a road-use agreement, a drainage crossing agreement, and a decommissioning agreement. Drain tiles are a big problem for wind farm owners because anything that goes wrong is usually blamed on the wind farm, so they are used to fixing the drains near turbines whether or not they caused the problem. A wind farm has its own LLC so the agreements it makes stay in effect if ownership changes. The decommissioning agreement requires a bond or escrow account so even if the LLC goes bankrupt, there will be monies for removing towers. One of the wind farm representatives said the current cost of removing a wind farm was about two million dollars. The reason the amount is so small is that the turbines have considerable scrap value, which offsets some of the total cost. There were questions about tax abatements, which is a concern of the County Council, not the Commissioners. Apparently the wind farms usually get a tax abatement but then give much or all of that money back to the county in the economic development agreement. The advantage for the county seem to be that they have fewer restrictions on how they can use that money than they would have if it came via taxes. If the issue comes before the County Council in the next few years, I may learn more. Before any construction on a wind farm can begin, approval is needed from six county bodies: Commissioners, Drainage Board, Plan Commission, BZA, Airport Authority, and County Council. The Commissioners then discussed among themselves what additional changes they wanted to make and their discussion was drowned out by audience noise. Regaining the audience’s attention, they announced that they had reduced the decibels allowed at a residence from 50 to 45 and made a couple of other changes and then voted to approve the ordinance. It now goes back to the Plan Commission. The meeting adjourned a few minutes before noon.